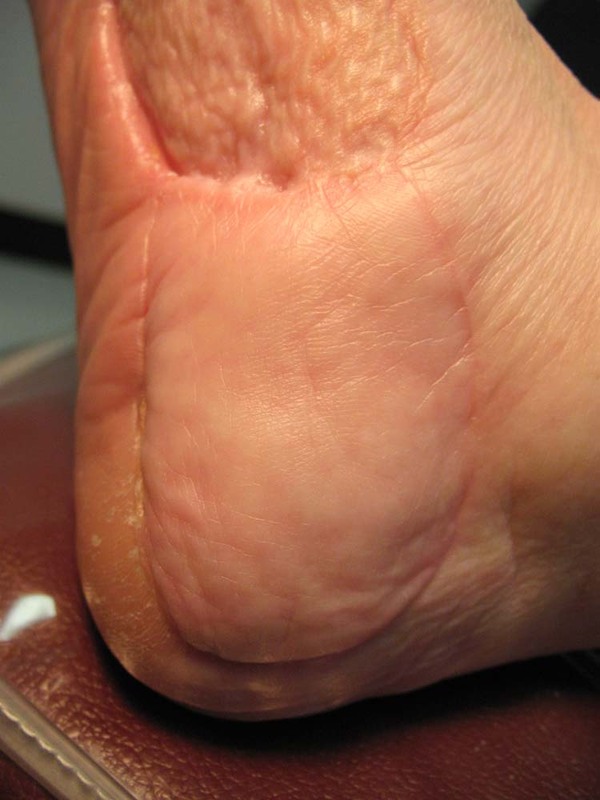 A case report is presented describing a clear cell sarcoma of the foot (malignant melanoma of soft parts). Melanoma is most commonly associated with pigmented lesions and nodules of the skin. Clear cell sarcoma (CCS) is an anaplastic tumor consisting of cells derived from melanoblasts not forming melanin in the skin, but rather mitotic changes more consistent with malignant melanoma in subcutaneous tissue, tendons and aponeuroses. The tumor is very rare and can pose clinical challenges in early diagnosis since the tumor lacks pigment and obvious color changes and can clinically appear as a benign soft tissue tumor. A case report including surgical excision, histologic features, and survival prognosis is presented. Malignant melanoma is a relatively rare skin cancer accounting for only 4% of all skin cancers. Clear cell sarcomas account for less than 1% of all melanomas. Clear cell sarcoma (CCS) is an indolent tumor of unknown histogenesis involving subcutaneous tissue, tendon and aponeurosis. CCS is a very rare, malignant soft tissue tumor and often is called ‘malignant melanoma of soft parts’ due to the histologic similarities and lack of observable pigmentation often seen in cutaneous melanoma. It can affect all age ranges including children and young adults. The tumor is characterized by cytoplasmic melanosomes and melanotic mitotic figures isolated to the soft tissue without skin involvement. Interestingly, there is an increased incidence of lower extremity and foot CCS reported in the literature. It tends to present around the ankles and around the heel and aponeurosis of the plantar fascia. Clear cell sarcomas pose a particular challenge in early detection. The tumor is more common in younger individuals, but can occur at any age. These lesions may start rather innocuously as a small, non-pigmented swelling and lay in situ for many years. Clear cell sarcomas may show a more rapid growth after laying in situ. In particular, the border of the lesion may become irregular and progress with diameter enlargement. It is common to use the “A,B,C,D,E criteria” for early detection of malignant melanoma and this criteria may also be useful in the differential diagnosis of CCS. (Table 1) [1,12] Early and late tumors may only reveal asymmetry and size changes. Table 1 Clear cell sarcoma (CCS) often meets four of the five criteria of malignant melanoma with asymmetry, border irregularity, diameter enlargement, and evolving changes of the tumor. 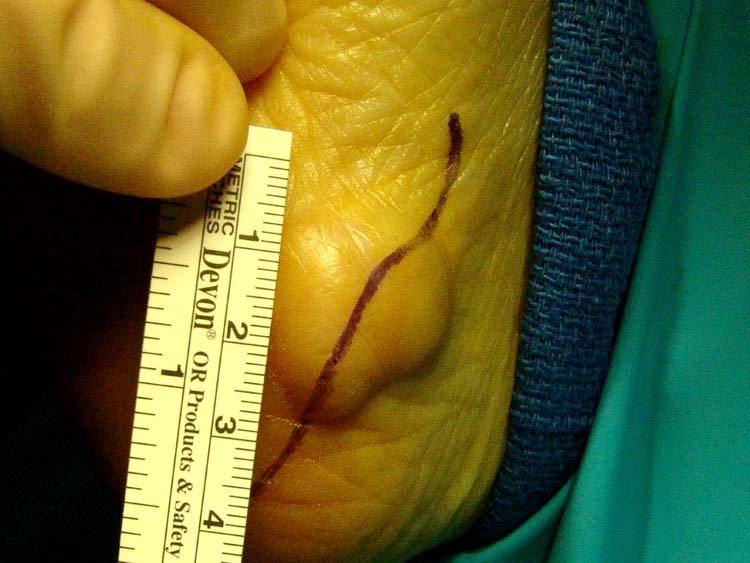 A 61 year-old female presents with a painful, soft tissue tumor of the right medial heel. The tumor is irregular in shape, non-movable and firm to palpation (Fig. 1). The tumor became bothersome in February 2007. She relates the tumor was present for 12 years and had remained small and non-painful. Figure 1 The lesion is irregular, firm and non-movable. It is painful to palpation and measures about 2 cm in diameter. Over the past 2 years, she states it began to enlarge. There is no history of trauma. Further questioning revealed a history of previous nevi of the abdomen and neck. Multiple lesions had been biopsied in the past, but were negative for malignant transformation. She had a similar nodule on her neck. The patient had seen a dermatologist, who suggested watching the lesion. A differential diagnosis of the tumor includes benign lipoma, dermoid tumor or cyst, dermatofibroma, fibroxanthoma, dermatofibrosarcoma, nodular fibroma, lipoblastoma and giant cell fibroblastoma. It was decided to take the patient to surgery for excisional biopsy, removing the tumor. The patient was brought to an out-patient operating facility and underwent local removal of the tumor. A curvilinear approach was planned to gain maximum exposure for removal of the tumor. During surgery, it was noted the tumor was nodular and adherent to the underlying epidermal tissue. Blunt dissection was used to remove the tumor. Redundant skin was sectioned and sent with the tumor to pathology for identification (Fig. 2). Figure 2 The tumor is nodular and adherent to the underlying epidermis extending through the dermis and subcutaneous fat. The specimen was designated “foot mass.” The gross specimen measured 2.1 x 1.8 x 1.4-cm. (Fig. 3). The gross specimen was described as rubbery, yellow to pink-tan, fibrofatty soft tissue. 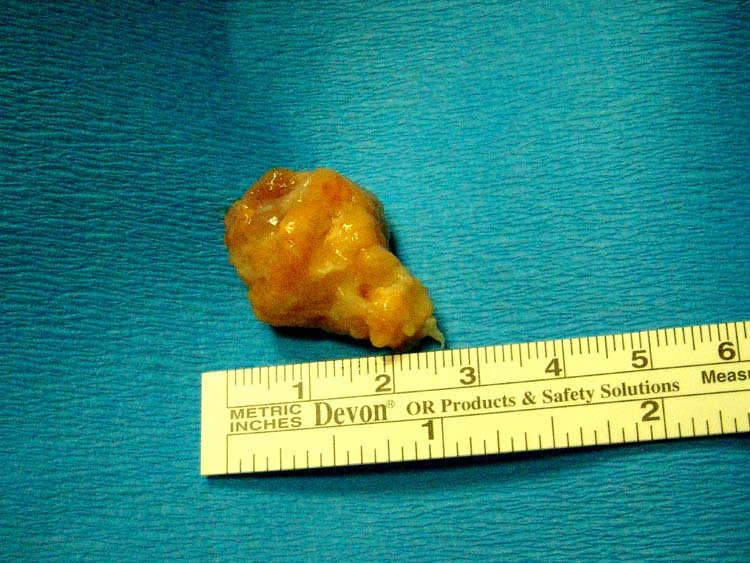 Figure 3 The tumor, once removed, is a firm, lobulated mass within subcutaneous fat measuring 2.1 x 1.8 x 1.4 cm. The specimen is inked and serially sectioned to reveal an edematous, pink to red-tan lobulated mass with a variegated cut surface that measures about 1.5 x 1.4 x 1.2 cm. Microscopic sections are stained routinely and underwent additional immunostains including Mart-1, CD10, HMB45, S-100, vimentin and pankeratin/cytokeratin. Routine stains show a malignant, predominantly spindle cell, neoplasm that diffusely infiltrates into and between connective tissue bundles and extends into adipose tissue. The neoplastic cells are arranged as vaguely cohesive aggregates which sometimes form ill-defined, loosely associated fascicles of variable size and thickness seen in various planes of section. Other fields show epithelioid-like clusters composed of smaller nests of spindle cells. 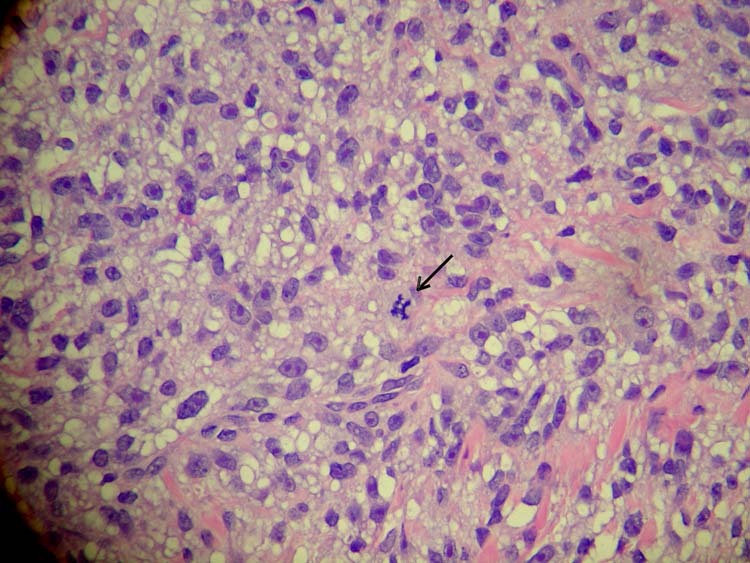 Individual neoplastic cells contain oval to fusiform nuclei with prominent large macronucleoli. The nuclear to cytoplasm ratios are elevated. Mitotic figures are frequently encountered. The cytoplasm tends to be clear with some cells showing amphophilic cytoplasm (Fig. 4). Figure 4 Under simple H&E (Hematoxylin–eosin) stains. 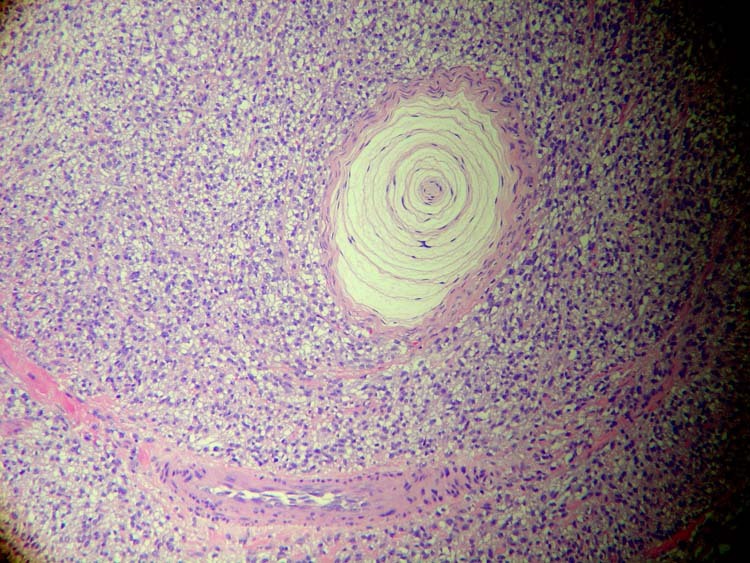 Slide 1 in low power, reveals melanoma cells around a Pacinian corpuscle. Slide 2 in higher power, shows mitotic figures (arrow) in center with multiple, macronucleolus and fusiform nuclei within the tumor cells. Slide 3 reveals predominant spindle cells to the neoplasm. The cells are arranged as loose, cohesive aggregates and epitheliod like clusters of smaller nests of spindle cells. 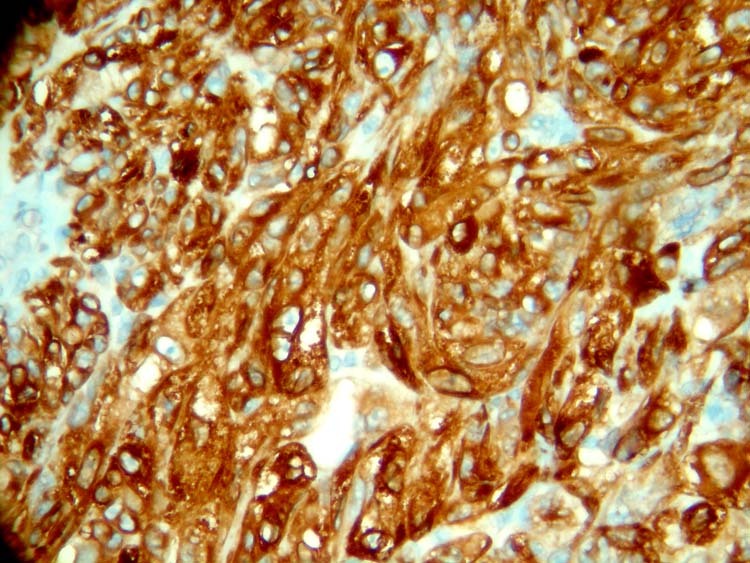 Figure 5 Immunoperioxidase stains using Mart-1 is highly specific for melanoma. Melan-A immunoperoxidase stains melanoma cells brown. The brown staining on these slides is considered positive for malignant melanoma. This case was deferred to M.D. Anderson Cancer Center of Houston and reviewed by Dr. Harry Evans. 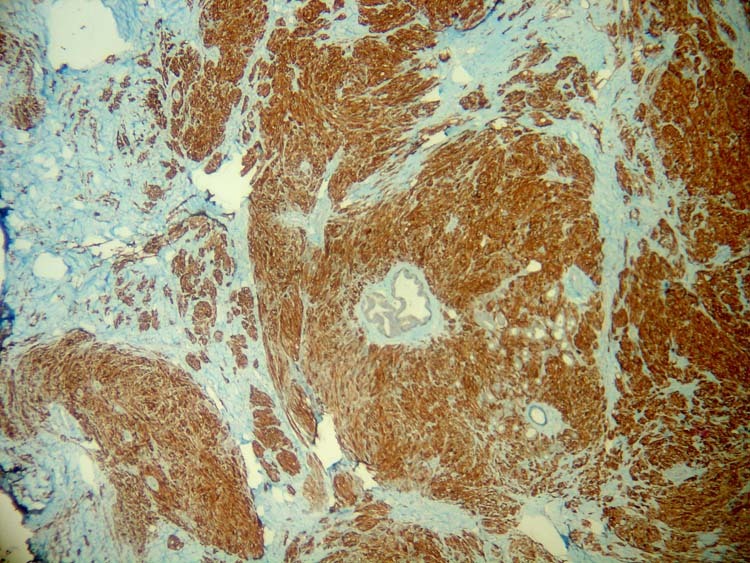 Submitted stains for S-100, MART-1 and HMB-45 were positive with negative keratin consistent with clear cell sarcoma. The t(12;22) chromosomal translocation was not reported. This case highlights the challenges of early detection of CCS. This is especially true of the foot. More troubling is the fact that the plantar aspect of the foot is often a common site for malignant melanoma. 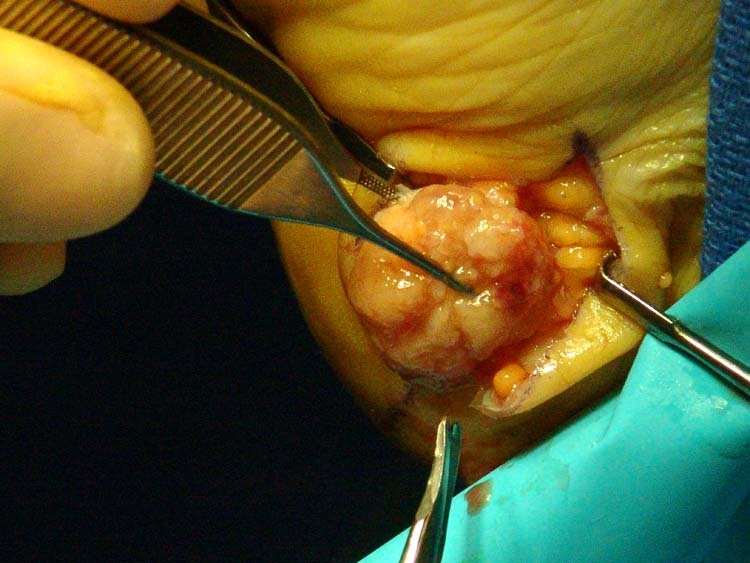 [4,7] This tumor appears to have been in-situ for many years without radical growth before a more rapid increase in size and associated pain. 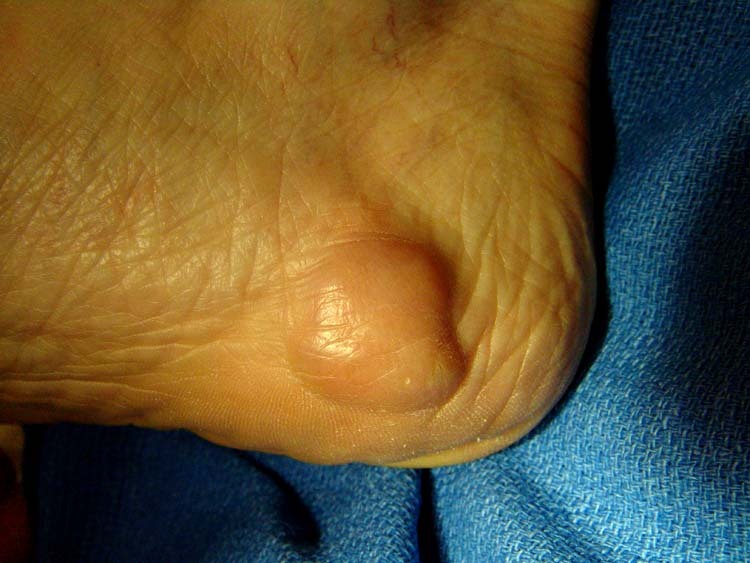 Any recent change in a soft tissue nodule, change in symmetry of the tumor or any suspicious soft tissue mass along the ankle or foot may present clear cell sarcoma as a differential diagnosis. There are now specific immunoreactive markers used to delineate clear cell sarcoma. More specifically, S-100 and HMB-45 are used to differentiate clear cell sarcoma from epithelial tumors, and more specifically, synovial sarcoma. Although the absence of keratin with positive S-100 and HMB-45 immunostains is often associated with the primary diagnosis of CCS, faint keratin immunoreactivity has been observed in clear cell sarcoma. Therefore, keratin positivity does not rule out CCS. More recently, molecular genetic characterization of clear cell sarcoma has shown to be specific for t(12;22) chromosomal translocation which is typically not present in cutaneous malignant melanoma. However, the t(12;22) chromosomal translocation may not always be identifiable in some cases. In this particular case, the tumor was initially excised and a larger margin of tissue will need to be removed. This will likely include wide excision with split thickness skin grafting. Sentinel node biopsy is highly recommended in all cases of diagnosed CCS due to the propensity of lymph node metastasis. This case describes a solitary, subcutaneous lesion that histologically represents clear cell sarcoma or malignant melanoma of soft parts. The diameter of this tumor is over 2 cm and less than 5 cm. However, more aggressive resection of tissue and lymph node biopsy is required to map the tumor margins and rule out metastasis. This patient had previous nevi and a similar nodule located on the neck that may reveal other malignancy. This patient is presently under further investigation and testing for primary sources of the tumor and evidence of metastasis. At the time of this writing, the PET and CT scans were negative, so the overall, long-term prognosis is promising. 1. Swetter, S.M., et al: Malignant Melanoma. Emedicine online [online]. 2. Katabuchi, H, el al: Clear cell sarcoma arising in the retroperitoneum. In J Gynecol Cancer: 12(1): 124-127, Jan-Feb, 2002. 3. Finley, et al: Clear cell sarcoma: the Roswell Park experience: Journal of Surgical Oncology, 77(1):16-20, May 2001. 5. Fujimura, Y., el al: The EWS-ATF-1 gene involved in malignant melanoma of soft parts with t(12;22) chromosome translocation, encodes a constitutive transcriptional activator. Oncogene 12: 159-167, 1996. 6. Deenik, W. et al: Clear cell sarcoma (malignant melanoma) of soft parts: A clinicopathologic study of 30 cases. Cancer 86(6): 969-975, September 1999. 7. Sara, AS, et al: Malignant melanoma of soft parts (clear cell sarcoma). A study of 17 cases, with emphasis on prognostic factors. Cancer, 65 (2): 367-374, January 1990. 8. Moritake, H. et al: Newly established clear cell carcinoma (malignant melanoma of soft parts) cell line expression melanoma-associated Melan-A antigen and overextpressing C-MYC oncogene. Cancer Genet Cytogent, 135(1):48-56, May 2002. 9. Patel, RM, et al: Dual-color, break-aparat fluorescence in situ hybridization for EWS gene rearrangement distinguishes clear cell sarcoma of soft tissue from malignant melanoma. Mod Pathol. 18(12):1585-1590, December 2005. 10. Lucas, et al: Clear cell sarcoma of soft tissues. Mayo Clinic experience with 35 cases. Am J Surg Pathol: 16(12): 1197-1204, December 1992. 11. Eckardt, JJ, et al. 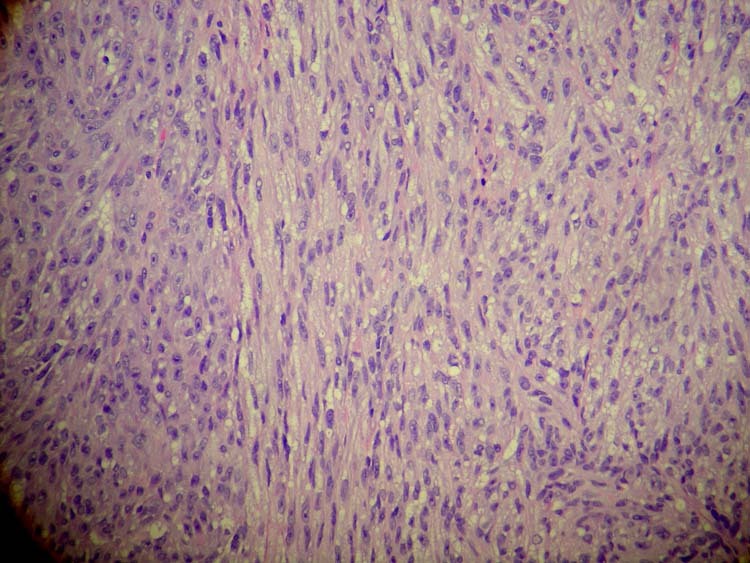 Clear cell sarcoma. A clinicopathologic study of 27 cases. Cancer. 52(8): 1482-1488, October 1983. 12. Strayer, S.M., Reynolds, P. Diagnosing skin malignancy: Assessment of predictive clinical criteria and risk factors. The Journal of Family Practice. Vol. 52, No.3, March 2003 [online]. Special thanks to Kenneth Linville, MD and Michael Bailey, MD in preparing the slides. Thanks to Harry Evans, MD from MD Anderson Cancer Center for review of this case. 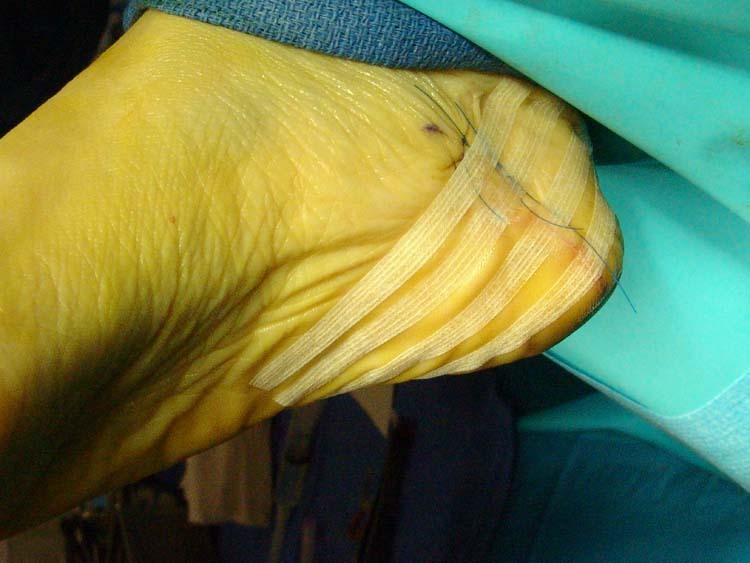 Figure 6 3 months after the patient’s original surgery, she underwent additional wide excision including rotational full thickness graft with STSG of the arch. The patient underwent a single surgery including sentinel node biopsy (groin) and wide excision with rotational skin flap and split thickness skin graft. This was performed by a surgical oncologist and plastic surgeon. The initial wide excision was performed by the surgical oncologist who noted the tumor tissue extending into the longitudinal arch. The plastic surgeon, on the same day of surgery, performed the rotational flap and STSG to cover the defect. Sentinel node biopsy was positive and the patient refused additional surgery to remove all the inguinal lymph nodes. 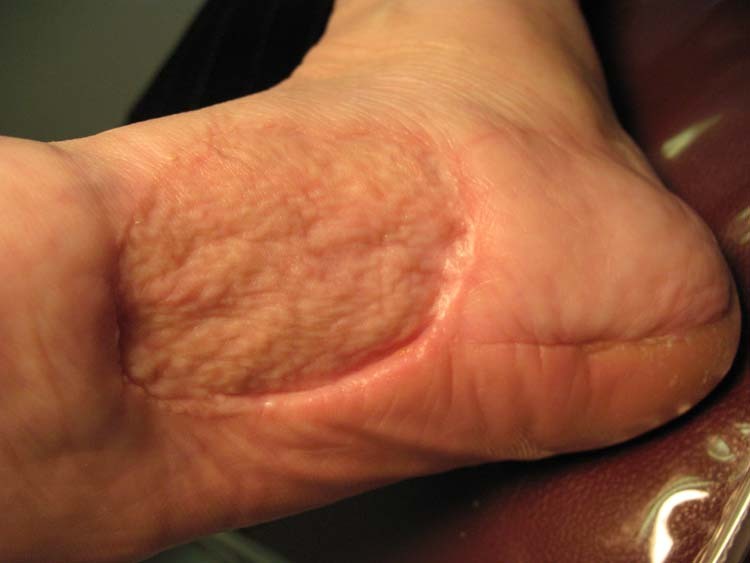 About 2 months after surgery, she underwent radiation treatment to the foot. 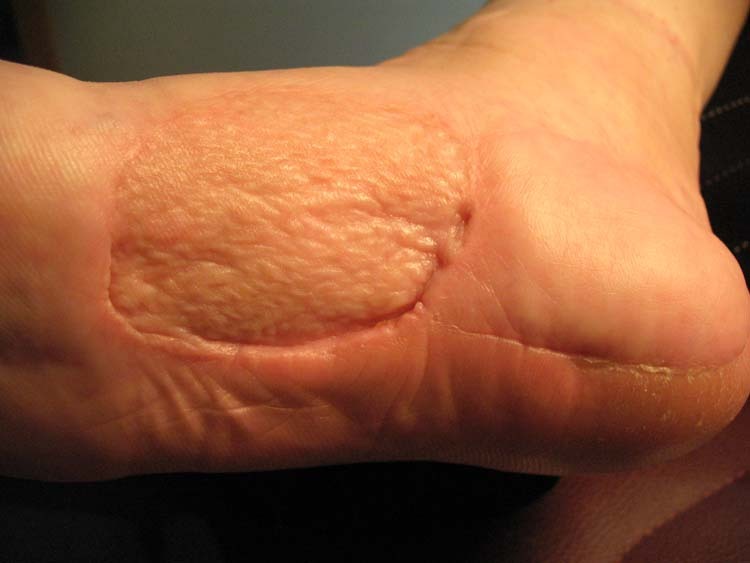 Complications of treatment included slight infection of the graft edges and “blisters” of the foot. The heel portion of the rotational graft was sensitive and took some time to desensitize. She was placed in a total contact cast during this recovery period. Since that time, she has had some residual swelling of the foot and ankle that is responding to local compression bracing. Her long term prognosis is hopeful. It has already been one year since the initial surgery and additional node biopsies are still a consideration. 1Adjunct Clinical Faculty, Barry University School of Podiatric Medicine. Private practice, Chief of Podiatry, Doctors Regional Medical Center. Corpus Christi, Texas, 78411. This entry was posted in Uncategorized and tagged Clear cell sarcoma, malignant melanoma of soft parts, Metastasis, Uncategorized. Bookmark the permalink.